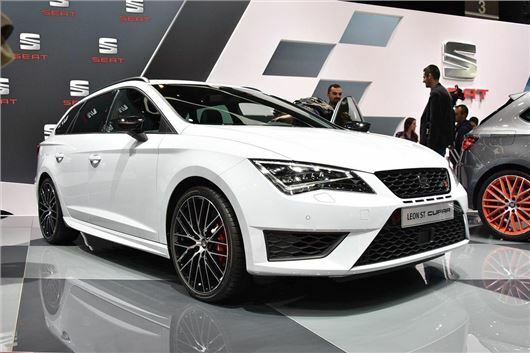 SEAT has stretched more out of the Cupra brand, quite literally, with the unveiling of the new Leon ST Cupra, which is expected to cost from around £28,500. It goes on sale in March 2015 and will appear in the same month at the Geneva Motor Show. It means that SEAT’s most powerful production car ever is now available as an estate, creating a usefully practical 280 PS niche model that will give potential Ford Focus ST Estate buyers something to think about. Its appeal lies in its unorthodox combination of a 597-litre boot space and potential six-second 0-62mph completion. That boot grows to 1470 litres with the rear bench down, and fuel economy is rated at 42.8mpg with 154g/km CO2 – not bad at all from a 2.0-litre four-cylinder turbo petrol engine of such precipitous pace. As per the SC (three-door) and five-door versions, the ST Cupra comes as standard with a six-speed manual transmission, or optionally a six-speed DSG. It will also be available with SEAT’s ‘Sub8 Performance Pack’, a nod to the Cupra’s PR-tastic Renaultsport-trumping run around the Nurburgring, which adds bigger brakes, 19-inch alloy wheels and coloured side skirts, all for about two grand. The basic Cupra package with 265PS (just called ‘Cupra’, as opposed to ‘Cupra 280’) is also available as an ST. It has smaller wheels, a less comprehensive specification sheet, and a 0-62mph time a whole tenth of a second slower than its 15PS superior namesake. That means 6.2 seconds with a manual, or 6.1 seconds with a DSG, as opposed to 6.1 seconds and six flat respectively in the 280. Standard fit is SEAT’s Dynamic Chassis Control system, which allows throttle, steering and DSG shift patterns to be altered between comfort and sporty modes, while a mechanical front differential lock is capable of shifting power 100 per cent to either side, giving additional cornering tenacity in a car that is running huge power through the front wheels. Full-LED headlights are standard (although SEAT has been giving them away for free on lesser Leon versions from the model's launch), as are sports seats, a touchscreen media system and aluminium pedals. There is no announcement on pricing yet, although expect a £1000 premium over an equivalent Leon Cupra five-door, meaning an ST Cupra 280 should be around £28,500.